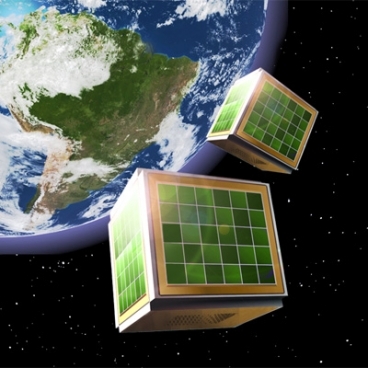 CubeSats are small, Rubik's Cube-sized satellites that can help researchers conduct near-Earth space observations. They can cost as little as $40,000 to deploy, if they piggyback onto an already-scheduled launch. About the size of a computer chip, the mini-thruster design also overcomes the size constraints of chemical propulsion and other forms of electric propulsion because it does not require a bulky chamber to burn (chemical) or extract ions from (electric) the propellant. Lozano’s design relies on electrospraying, a physics process that uses electricity to extract positive and negative ions from a liquid salt that is created in a laboratory and serves as the system’s propellant. The liquid contains no solvent, such as water, and can be charged electrically with no heat involved. Whereas other electric propulsion systems charge the ions in a chamber on the satellite, the ionic liquid in Lozano’s design has already been charged on the ground, which is why his system doesn’t need a chamber. These small satellites, able to maneuver autonomously and fly independently, remind me of the buzz droids shown in Star Wars: Revenge of the Sith. See also this article on Pico Satellites designed to work in teams. From MIT via Next Big Future.